Capricorn's demands can't be satisfied by Sagittarius's flighty, light-hearted approach to love. Both have high aspirations in life but their approaches are totally different. Capricorn wants to climb to the top of the mountain; Sagittarius wants to fly over the top. Sagittarius's frank, outspoken nature is sure to rile Capricorn's sensibilities. Capricorn is restrictive, a loner, known for its dour outlook. 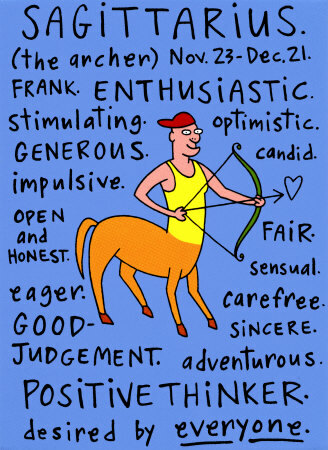 Sagittarius is venturesome, sociable, expansive. Capricorn is cautious with money and concerned with appearances and Sagittarius is neither. Sagittarius will become secretive when it learns of Capricorn's many rules and restrictions. Capricorn will be hurt that it's not taken seriously. Sagittarius disappearing acts will leave Capricorn dismayed. A frustrating match.